So I’ve been playing with Google+ now for a while and I wanted to post some of my thoughts regarding two specific aspects of it. Using it for Lifestreaming and the issues with creating circles or lists in general for that matter. You may not believe me when I say this, but I’m happy that Google+ doesn’t offer the ability to import and aggregate content from 3rd party services. My personal stance on this has changed quite a bit over the years. During the early days of Lifestreaming I would pick a single service for a specific content type (i.e. Flickr for photos) and import all the data I created there into my Lifestreaming software or service. As time went on I realized that an all or nothing approach with regards to importing content didn’t make sense. There were times were I might generate multiple versions of the same content on a Lifestreaming service. For instance I would bookmark a page on Delicious as well as share it on Twitter and in both cases that same link appeared in my Lifestream because I was importing all content generated from both services. There were many other ways that these duplicates would occur. I’ve written several posts on this subject including the crazy flowcharts we go through when deciding to post a photo, highlighting the examples of people’s workflows when it comes to posting content, and even coming to the realization that I’ve become neurotic when it comes to determining how and where to post content. I finally decided stop being a content pollutant. In my case I decided to take a step back and do a social inventory of how and where I was sharing content. There were several facets to this but the theme behind most of them was to remove automated importing or synchronization of content between services where they didn’t make sense. For instance I at one time had sync’d my Twitter account to Facebook so that every tweet would appear there. I originally treated Facebook much like FriendFeed and figured I’d just make sure to post my status updates there as well. As time went on more of my non-tech friends and family joined the service and then it became clear that I was just some noisy person saying things that weren’t really relevant to most of them not to mention that much of Twitter’s usage is of different context to Facebook updates. So what have been some of my new strategies with regards to Lifestreaming? Well there’s been a few changes I’ve implemented with regards to how I go about creating and sharing. For a very long time I was using the WordPress Lifestream plugin to do the traditional reverse chronological aggregation of all imported content for the Lifestream on my personal blog. I still think this is great to use for a personal basis for digitally archiving our lives, but don’t think it offers a good external facing option for other people based on many of the examples I’ve given. While I continue to test and use several services I currently point my personal blog to Flavors.me for my Lifestream. I feel that they provide a visually compelling way to display my lifestream that is also segregated by content type which makes navigation for people with selective interests easier and avoids noisy duplication. Another strategy I’ve really become a fan of is selective syndication of content. I became a fan of this originally using Posterous for photos using email as well as their bookmarklet for sharing links but it was a bit cumbersome and I’ve since abandoned that method. Currently my favorite example of selective syndication is in the method used by Instagram and PicPlz. I like that I can easily determine what 3rd party services I want to share every photo I add to their service. To keep things simple my strategy is to try and find a single source for each content type that offers the options to syndicate to all the other services/communities I want I’m a member of. Right now I hear many people saying that they’re happy that you can’t import content from other services (which as you read I agree) and that it’s a pristine network where people have to manually share content and there are many realtime conversations that are spawning from that which is no doubt the big attraction right now. But it won’t be long before the floodgates open when everyone joins the service, the API gets released, and pretty soon it will become another social network dumping ground. So you say Circles alleviates that right? Well not necessarily. The unique value of circles is in its ability to let us selectively share content with predefined groups but from a data consumption standpoint it’s no different than Twitter lists or Facebook lists. You may label me or other users as tech but not all of my posts will be tech related. All users have different methods for how they will choose to sync accounts, selectively syndicate, or balance the topics of their posts. This will not change on this service. So while I like to dip in and check the status of friends posts and interact I now rely more on the social magazine content readers to filter and prioritize all the news the people I follow are sharing. Anyways, I’m a big fan of Google+ and have really enjoyed the service so far I really look forward to watching it open up and evolve. If it gains adoption and a large user base, I hope they quickly add support from third party services to syndicate there, as a service to be added to social content readers, some unique mobile apps, and all the other goodies we expect a top tier social network to offer. If you want to friend up you can find me here. Nice post Mark. Why Flavors.me and not About.met? I was worse in my Facebook importing. Rather than importing my tweets, I imported my entire FriendFeed stream. Not only did this have a lot of stuff, but because of the way that import works it all looked like it was coming from FriendFeed. To make matters worse, one of the imported items was a Twitter search for mentions of my Twitter account – so my Facebook account showed items supposedly from me that were not authored by me. Confusing even to the non-novice user! At this point, my Google+ use is hampered by the fact that most users are still early adopters. However, I’ve started to find some users who are interested in biometrics (my day job) and have created circles around this. 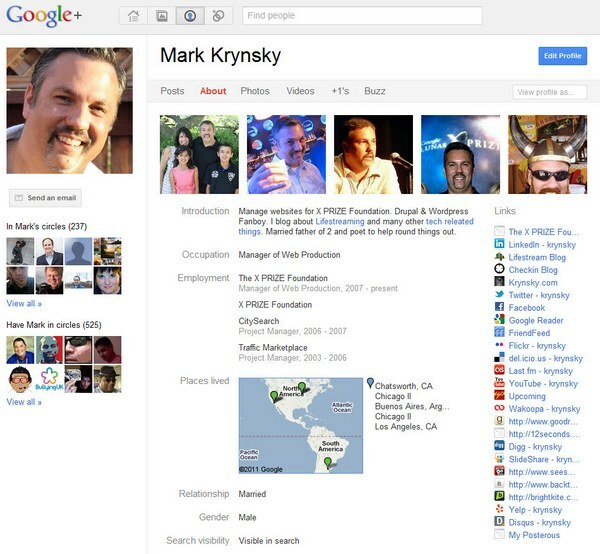 In addition, the Oracle folks are represented on Google+, so I can engage in Oracle conversations. They definitely need to add search ASAP and should hopefully excel in this area ahead of any other service. Good stuff. BTW, could you use more whitespace (=more paragaphs) for better readability please? Thanks.